​​ ​DALLAS-FORT WORTH – Multifamily absorption reached the highest level in the last decade during 2017 at a time when completions were at peak levels, according to Marcus & Millichap’s DFW Multifamily First Quarter 2018 report. Completions rise again in 2018, remaining well above the five-year average, and developers are set to bring a record number of 32,000 units online. 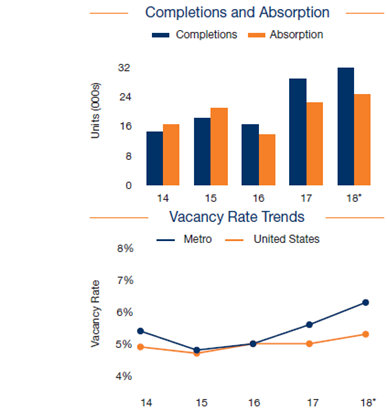 Vacancy rises again by 70 basis points in 2018 as deliveries are elevated, reaching 6.3 percent. Check out more DFW Multifamily​ Market Research.